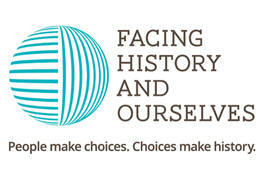 Facing History and Ourselves integrates history, literature, and human behavior with ethical decision making and innovative teaching strategies to enable secondary school teachers to promote students’ historical understanding and connections to current events, critical thinking, and social emotional learning. Facing History was founded in 1976 by Margot Stern Strom, a Brookline-based educator who grew up in Memphis, Tennessee during the height of segregation. While at a conference on teaching the Holocaust, Stern Strom listened to presentations about the history of antisemitism and the meaning of genocide, and found herself wondering why she had never heard these events addressed in such a way in classrooms. Reflecting on her childhood, where she witnessed segregation and the danger of ignorance, and the lack of meaningful and reflective education on issues like bigotry and genocide, Stern Strom set out to create a set of lessons on the Holocaust with grants from Brookline Public Schools and the Danforth Foundation. Created in 1974, these lesson plans would eventually become Facing History’s first publication, 1982’s Holocaust and Human Behavior. As Facing History grew in size, so did its mission and vision. In the early 1980s, the first program associates (former classroom educators who deliver Facing History’s services) were hired, and the first regional office was founded in Chicago in 1990. Facing History developed the scope and sequence (learning journey), which we still use today, as well as a pedagogical triangle based around informed civic responsibility. Through every Facing History publication, we have striven to emphasize the idea that no event is inevitable, and instead is composed of the choices people make as members of a society. Since its inception, Facing History has achieved many major milestones. Between 2008 and 2014, some of our most important publications, Choices in Little Rock, The Reconstruction Era, and Teaching Mockingbird were published. Since 1992, Facing History has implemented programming in Europe, and since 2003 has reached teachers and students in the UK, South Africa, Rwanda, and Northern Ireland, among other countries. Facing History’s programming and materials are primarily delivered for educators through seminars and workshops, forums, and our partner schools’ systems. The intent is to model teaching strategies, materials, and activities so that educators can more effectively facilitate these with their students. Facing History created the Pedagogical Triangle for Historical and Civic Understanding to serve as a touchstone for balanced program and lesson planning. 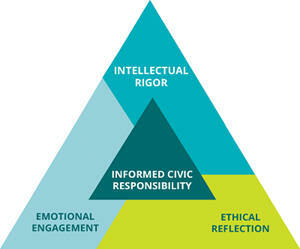 The arrows between intellectual rigor, emotional engagement, and ethical reflection are bidirectional, as these processes strengthen each other. At the center is the students’ civic agency, their belief that they can play a positive role in their peer groups, schools, communities, and larger world. Seminars and workshops for educators: Our seminars and workshops provide deep engagement with Facing History content, pedagogy, and teaching strategies. Seminars, both in-person and online, provide educators with an in-depth examination of one of our historical case studies. Each case study takes them through Facing History’s Scope and Sequence, or Learning Journey. That journey begins by exploring the themes of identity and group membership, followed by issues of human behavior, historical legacies, and active participation in society. As they study Facing History, educators (and later their students) learn the historical underpinnings of inequality and prejudice and make the essential connections between how important moments in history continue to impact the world today. Seminars typically last three to five days and focus on one major case study, while including Facing History’s whole scope and sequence method. 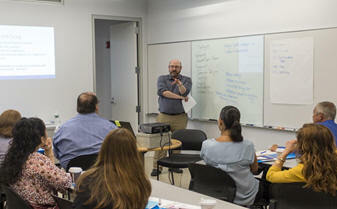 Workshops are offered both in-person and online and vary in length from to one to three days. They may address a particular Facing History resource or current events topic, and may or may not include Facing History’s scope and sequence, depending on the workshop’s length. After completing professional development, participants receive access to Facing History’s lending library and are offered coaching from a Facing History Program Associate. They are also given continued support through follow-up workshops and special events. Democracy at Risk: Holocaust and Human Behavior: This seminar guides participants through the history of the Holocaust and explores the different ways individuals, groups, leaders, and nations acted in the face of injustice. This seminar incorporates new scholarship and interactive digital resources from the fourth edition of the Holocaust and Human Behavior resource. Democracy and Civil Engagement: This seminar explores the nature of identity, belonging, tolerance, and difference in our increasingly global society. Participants have meaningful conversations about bigotry, religious freedom, the nature of democracy, and civic participation. Progressive Era and Jim Crow segregation. Using a case study of the events at Central High School in Little Rock, Arkansas in 1957, participants explore ideas of citizenship and belonging, and the role of civic choices—the decisions people make as citizens in a democracy. Choices in Little Rock: In 1957, nine black teenagers faced the threats of angry mobs when they attempted to enter Central High School in Little Rock, Arkansas. In this workshop, participants examine this key moment in U.S. history and learn new ways to engage students in the issues raised by the American civil rights movement and their implications today. A Facing History Approach to Teaching “Night”: This workshop prepares English Language Arts teachers to interweave a literary analysis of Elie Wiesel's powerful and poignant Holocaust memoir,“Night”, with an exploration of the relevant historical context underlying Wiesel's experience. Participants use Facing History's newly-revised teaching guide, Teaching “Night”, to examine primary sources and explore essential questions of individual choice and identity. Facing Ferguson: News Literacy in a Digital Age: This workshop examines how implicit biases shape our understanding of the world, and how news literacy skills and concepts can help students find reliable information to make decisions, take action, and become effective civic participants in today’s complex information landscape. Facing History also provides educators with online learning opportunities through our On-Demand Learning Center (ODLC). Easy-to-use and available 24/7, the ODLC features short, self-paced professional development courses, videos of real Facing History teachers demonstrating our teaching methods in their classrooms, recorded webinars, and more. The ODLC is useful to educators with every level of experience with Facing History. For example, educators new to our approach can use the ODLC to see real examples of how our content and teaching methods work in the classroom, and veteran Facing History educators can use ODLC resources to further refine their use of Facing History and engage in continuous professional development throughout their careers. One of Facing History’s most important initiatives is the PSN. Launched in 2008 with 12 participating schools, today the network includes 128 schools and reaches over 40,000 students each year. Partner schools embrace Facing History’s core themes, while weaving Facing History content and pedagogy throughout the school. Facing History’s programming is not limited to just the classroom; it appears in advisory groups, faculty meetings, curriculum planning, and school community activities. The PSN is built on common principles: to value the complexities of identity and combat prejudice, examine the choices of the past to inform our choices today, value intellectual rigor and emotional engagement, and foster dialogue, empathy, and civic participation. As part of the PSN, schools receive support and curriculum resources for teachers implementing Facing History content, on-site professional development, and many more opportunities. As members of the network, partner schools must integrate at least one Facing History case study into the core curriculum, enroll two or more teachers in Facing History workshops and seminars, and integrate Facing History themes and pedagogy throughout the curriculum. In March 2018, the PSN marked another milestone with the first Global PSN conference. Over 260 educators from the US, London, and Mexico participated in a three-day conference in Chicago that offered a range of professional development sessions. This conference provided educators with the opportunity to expand their network of peers and gain a deeper understanding of Facing History’s goals and programming. Over the last three years, the New England Facing History forum series has provided an opportunity for educators of all disciplines, schools leaders, community members, and other non-profit organizations to come together. Through the forums, participants are able to reflect on difficult contemporary issues and challenges that often create conflict in our own communities. Forums feature scholars or activists who provide context and suggestions to promote civic engagement, generating organic and meaningful dialogue across people of different backgrounds and experiences. In 2017 and 2018, New England forums addressed issues like race through our History, Democracy, and Civic Courage forum, and the history and importance of social justice movements through Changemakers and Upstanders: Striving for Social Justice in our Times. Due to the success of the New England forum series, forums are now being held in San Francisco, New York, and other Facing History regions across the country. In an increasingly polarized and difficult political climate, it is crucial that this kind of dialogue and reflection continue, while providing participants the opportunity to grapple with complex, important issues. Our international work advances civic education globally with educators, administrators, and representatives from non-governmental organizations and major institutions. Facing History has educational partnerships around the world, including Northern Ireland, Israel, South Africa, and China. Working with educators from over 110 countries—from Mexico and Colombia to Australia and Kuala Lumpur, we contract with schools, districts, museums, and other organizations to provide professional development on-site for teachers and faculty, and offer online professional development and support including online courses, workshops, and webinars. Facing History in South Africa Following the end of apartheid, Facing History and Ourselves partnered with the Western Cape Education Department and the Cape Town Holocaust Centre in 2003 to form an extraordinary program called "Facing the Past – Transforming our Future." Years later, Facing the Past is still here and has had a profound impact. Learn more about the Facing the Past program. Facing History in Northern Ireland Facing History and Ourselves' collaboration with the Corrymeela Community, "Facing Our History, Shaping the Future," inspired teachers at two schools to work together across the divisions that dictate so much of Northern Irish life. 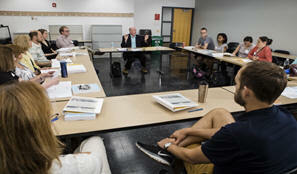 Read more about the the students' final project, "1916: A Tale of Two Stories." Facing History in China The China Project was created by Facing History and Ourselves in 2007 to help promote deeper cross-cultural engagement among educators in China and within our global network. We work with educators outside of China to better understand and teach about China, and we work with educators inside China to bring Facing History themes into their classrooms and encourage deeper reflection from their students. The China Project also includes the development of resources on watershed moments in Chinese history, including the cultural revolution, the Nanjing Atrocities, and the Chinese American experience; along with the integration of this content by educators in classrooms outside of China. We welcome you to get in touch with questions and ideas. Since 1976, Facing History has grown to nearly 180 staff members working in nine offices throughout the US, Canada, and the United Kingdom. We support educators beyond the reach of our regional office through extensive online resources and in-person events, and have formed educational partnerships around as world as part of our international reach. In 2018, over 78,000 educators implemented Facing History in their classrooms, reaching millions of students. Over 2,500 educators fully implemented Facing History programming in their classroom by teaching a Facing History unit of four weeks or more, reaching hundreds of thousands of students. Our educators network has grown to almost 200,000 members. In fiscal year 2018 (July 1, 2017-June 30, 2018), 25,341 new teachers trained in Facing History programs or download our resources, in comparison to just 18,086 in the previous year. The PSN includes public, private, charter, and parochial schools in and outside the United States. Our network ranges from cities like Chicago, Los Angeles, and Memphis, to Mexico, Ontario, and London. Over 60% of the schools we partner with have a majority of low income students. Facing History has been the subject of over 160 studies showing that our programming promotes rigorous academic engagement, historical understanding, and increases critical thinking, empathy, and civic agency. We continually work to evaluate the effectiveness our work with teachers, students, and schools, based on randomized controlled trials and numerous surveys and reports. 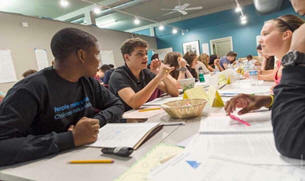 In 2015, the Collaborative for Academic, Social, and Emotional Learning (CASEL) named Facing History as one of only nine programs in the United States that has a proven positive effect on students, with Facing History one out of the two programs listed that work with middle and high school students. Facing History has been found to have a significant positive impact on students. Studies have shown that students exposed to Facing History content are twice as likely to report that their class motivate them to learn, and 1.7 times more likely to report that their class increased their interest in reading. Facing History students are 69% more likely to report feeling strongly that is it their responsibility to be involved in state and local issues, and 43% more likely to feel strongly that people like them can make a difference in their communities. Studies conducted by the Carnegie Corporation of New York and Harvard University demonstrated that students in Facing History classrooms show greater relationship maturity, a decrease in racist attitudes, and a greater value for those from different backgrounds. Through both professional development and the implementation of Facing History in schools, educators have also been found to greatly benefit from our content and pedagogical methods. 92% of Facing History teachers agree that Facing History helps their students stand up for what they believe in, and 91% agreed that Facing History promoted their students’ reading, writing, and speaking abilities. Facing History’s 2010 National Evaluation Study demonstrated that Facing History has a significant impact on the efficacy of teachers, which is crucial in increasing the achievement and motivation of students. Facing History works hard to provide educators with supportive and engaging professional development, with over 99% of teachers who participate in Facing History courses saying that they would recommend it to their colleagues. Our topic areas, found on the Facing History website, provide a starting point for educators and students for engaging with complex and challenging issues. These eight topics form a collection of free, searchable content that range from curriculum descriptions to primary source readings to videos. Educators can use this collection to search for material applicable to their current curriculum or for planning a new unit. A free excerpt from our Teaching Mockingbird, a guide to teaching To Kill a Mockingbird, is also available on our website. This sample is designed to give educators a look at our resources and methods.